At the beginning, the idea of "peak oil" seemed to be relatively uncomplicated: we would climb from one side and then go down the other side. But no, the story turned out to be devilishly complex. For one thing, there is no such a thing as "oil" intended as a combustible liquid -- there are tens, perhaps hundreds, of varieties of the stuff: light, heavy, sour, sweet, shale, tight, dumbbell, and more. And each variety has its story, its peculiarities, its trajectory over time. Eventually, all the oil curves have to end to zero but, in the meantime, there is a lot of wiggling up and down that continues to take us by surprise. Mostly, we didn't realize how rabidly the system would deny the physical reality of depletion, much preferring to "legislate scarcity" on the basis of pollution. The Peak of Diesel Fuel: 2018 edition. Six years ago we commented on this same blog that, of all the fuels derived from oil, diesel was the one that would probably see its production decline first. The reason why diesel production was likely to recede before that of, for example, gasoline had to do with the fall in conventional crude oil production since 2005 and the increasing weight of the so-called "unconventional oils," bad substitutes not always suitable to produce diesel. With the data of that 2012, I wrote "The Peak of Diesel". At that time, there was a certain stagnation of diesel production, but it seemed to be too soon to venture if it was final or if it could still be overcome. I reviewed the issue in 2015, in the post "The Peak of Diesel: Edition of 2015." The new data from 2015 showed that in 2012 there had really been no peaking, although diesel production had grown less strongly if we compared it with the previous historical rate, and even the last 18 months of the period studied at that time showed a certain stagnation. Now it has been another three years, and it is a good time to look at the data and see what happened. Before starting, I would like to thank Rafael Fernández Díez for having the patience to download the JODI data, for having elaborated the graphs I show here, slightly retouched, and for having made me notice the problem that is being raised with the refining of heavy oils (We'll see more below). He hasn't had time to finish this post and that's why I'm the one who wrote it, but what follows is actually his work. As in the previous two posts, we will use the database of the Joint Oil Data Initiative (JODI). This database provides information about most of the world's oil and refined products, but not all of them. The countries not included are countries with serious internal problems and a great lack of transparency, either because of wars or because they are very tight dictatorships. For this reason, the figures that I will show are around 10% lower than they should be if they were representing the whole world. However, given the characteristics of the excluded countries, it is most likely that their data did not change the observed trends, only the total amounts. As seen in the graph, the year 2015 marked the maximum so far. 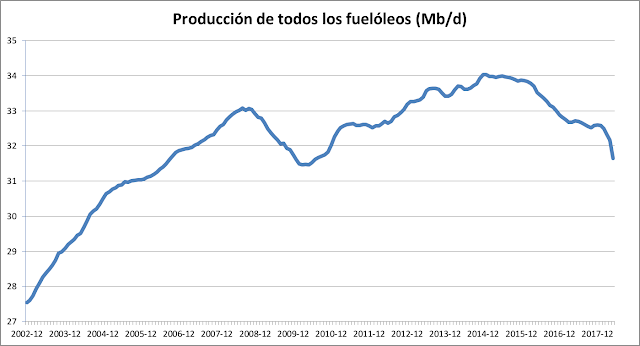 There had not been such a marked drop in production since the crisis of 2008-2009, but in the case of the fall of 2015 we find that 1) there has not been a serious global economic recession; 2) the descent is lasting longer and 3) the levels of diesel production show no sign of recovery. Although it is still a little early to ensure that the peak of diesel has occurred, stagnation - even falling - is starting to drag on for too long to be ignored. Looking at the data of JODI, two other very interesting things are observed. On the one hand, if one analyzes the production of all the fuel oil that is not diesel (fuel oil) it is found that its production has been in decline for years. 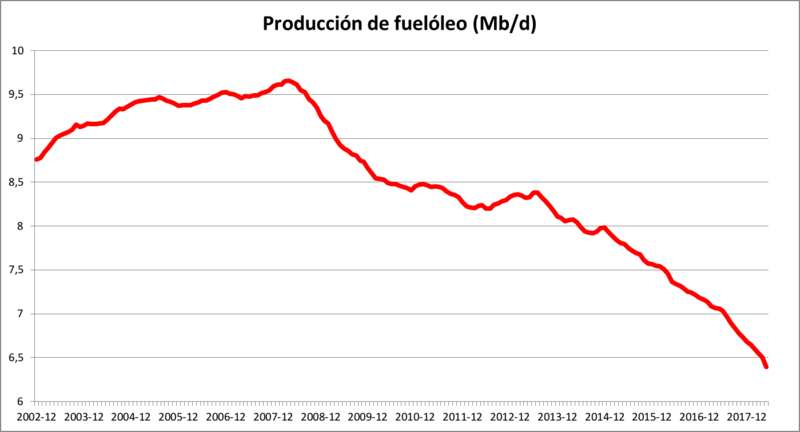 As the graph shows, since 2007 (and therefore before the official start of the economic crisis) the production of fuel oils is in decline and it seems to be a perfectly consolidated trend. The diehard economicist interpretation is to consider that there is simply no demand for these fuels (which, although of the same family, are heavier than diesel). When oil is refined, it is subjected to a process called cracking, in which the long molecular chains present in the oil are broken (by means of heat and other processes) and then the molecules are separated by their different properties of fluidity and density. The fact is that if you have made changes in the refineries to crack more oil molecules and get other lighter products (and that is why less heavy fuel oil is produced), those molecules that used to go to heavy fuel oil now go to other products. By logic, taking into account the added value of fuels with longer molecules, it is normal that these heavy fuel oils are undergoing cracking, especially to generate diesel and possibly more kerosene for airplanes and eventually more gasoline. We must not forget that from 2010 the fracking in the USA began to take off, flooding the market with light oil, which is not easy to refine to make diesel. It is therefore quite likely that the refineries have adapted to convert an increasing amount of heavy fuel oil into light fuel oil (diesel). 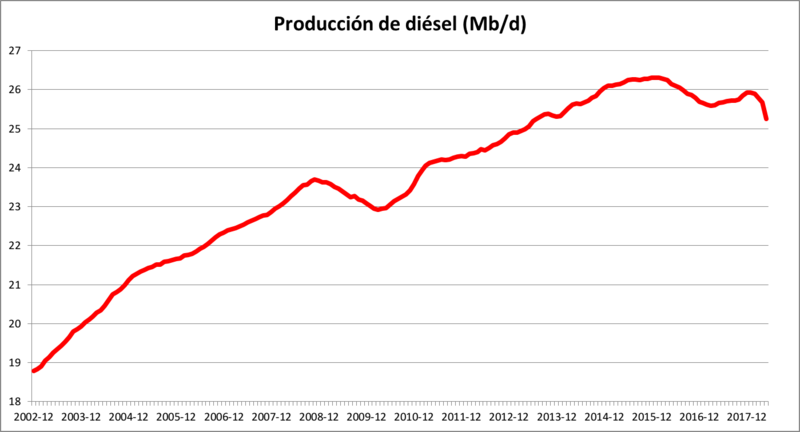 It reinforces this idea that, if we add the volumes of the two previous graphs we have, there is a certain compensation for the trends of diesel production, increasing until 2015, and the long-term trend of decrease of the rest of the fuel oils. 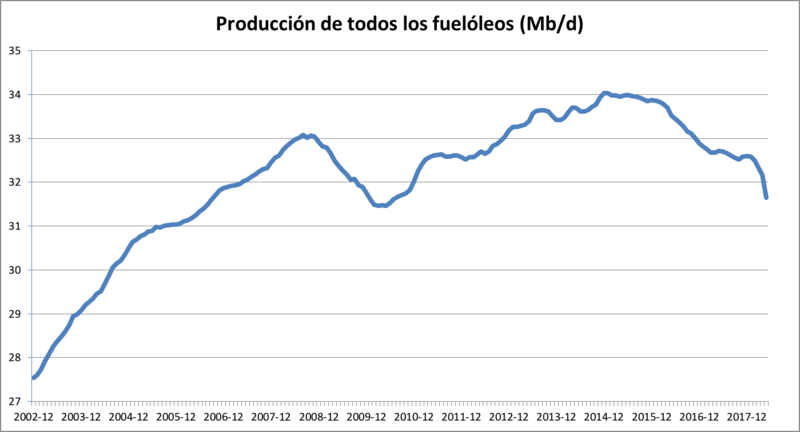 This figure shows that, after the 2008-2009 slump, it has been very hard to raise the total production of fuel oils, which peaked in 2014 and have remained there for almost a year; and at the moment it is suffering a resounding fall (about 2,5 Mb/d from the levels of 2014). This last observation is quite relevant because if, as you can guess, the industry is cracking less heavy fuel oil to ensure that the production of diesel does not go down too much, the rapid fall of heavy fuel oil will quickly drag down the diesel production. In fact, the graph shows that, after falling in 2015 and 2016, in 2017, it was possible to stabilize the production of all fuel oils, but it is also seen that in recent months there was a quite rapid fall. Surely, in this shortage, we can start noting the absence of some 2.5 Mb/d of conventional oil (more versatile for refining and therefore more suitable for the production of fuel oil), as we were told by the International Energy Agency in his last annual report. This explains the urgency to get rid of the diesel that has lately shaken the chancelleries of Europe: they hide behind real environmental problems (which have always troubled diesel, but which were always given less than a hoot) to try to make a quick adaptation to a situation of scarcity. A shortage that can be brutal, since no prevention was performed for a situation that has long been seen coming. The followers of that religion called economic liberalism will insist with all their strength that what is being observed here is a peak of demand, that old argumentative fallacy that does not agree with the data (who can think that people are stopping to consume oil because they want? Maybe because they have better alternatives? Which ones?). They will argue that there is a lower demand for diesel and that this is why production stagnates and that the production of fuel oils drops because, as they are more polluting fuels, the new environmental regulations do not allow their use. It's a bit of the old problem of who came first, the chicken or the egg. With regard to the fact that the demand for diesel does not increase, prices have a considerable influence: this is how shortages are regulated in a market economy. And, as for the environmental reasons, the production of heavy gas oil has been dropping from 2007, when there was not as much regulatory interest as there seems to be now. There is one aspect of the new regulations that I think is interesting to highlight here: from 2020 onwards, all ships will have to use fuel with a lower sulfur content. Since, typically, the large freighters use very heavy fuel oils, that requirement, they say, makes one fear that a shortage of diesel will occur. In fact, from what we have discussed in this post, what seems to be happening is that heavy fuel oils are declining very fast and ships will have no choice but to switch to diesel. That this is going to cause problems of diesel shortage is more than evident. It is an imminent problem, even more than the peaks in oil prices that, according to what the IEA announces, will appear by 2025. The second of the interesting things that the JODI data shows us is how the volume produced of all petroleum products has evolved. The volume produced has been able to continue increasing during these years thanks to the energy subsidy that the US is giving to the world by means of fracking. However, fracking oil only serves to make gasoline and that is why the diesel problem remains. But you can also note how the end of the graph above shows the same trend in the production of diesel, with a drop of more than 2 Mb/d. What does that mean? That the contribution of fracking to the whole volume is also hitting the ceiling, it does not get any higher. 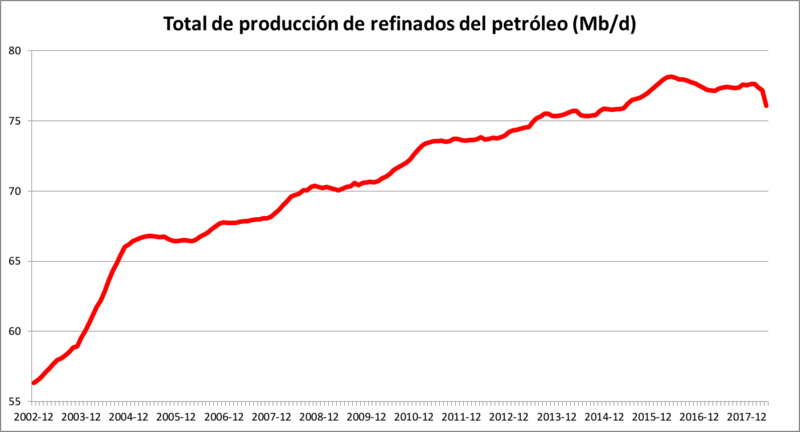 It is a further indication that we are already reaching the peak oil of all petroleum liquids. That is why, dear reader, when you are told that the taxes on your diesel car will be raised in a brutal way, now you know why. Because it is preferred to adjust these imbalances with a mechanism that seems to be a market (although this is actually less free and more adjusted) rather than telling the truth. The fact is that, from now on, what can be expected is a real persecution against cars with an internal combustion engine (gasoline will be next, a few years after diesel). Do not say that you were not notified (and I was not even the first to do it in this blog). And if it does not seem right, maybe what you should do is to demand that your representatives explain the truth. Note: this post was translated from Spanish using Google Translate, which did a pretty good job, necessitating only some retouches -- although the result is still somewhat "Spanish-sounding" even in English! 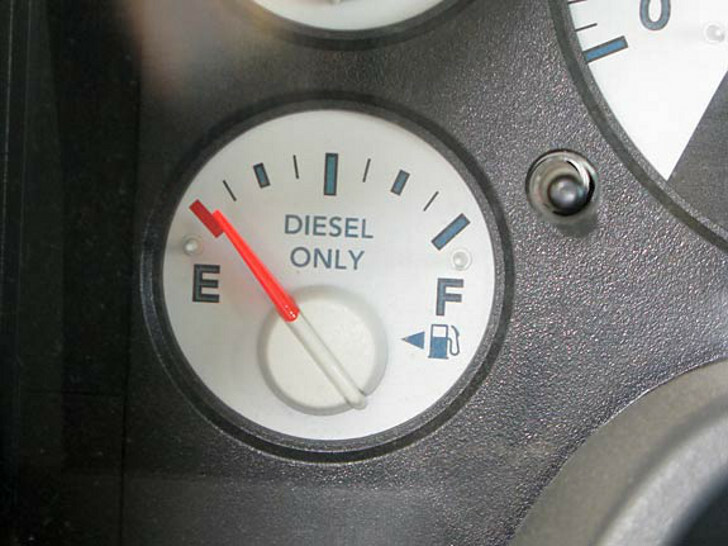 One problem is the use of the Spanish terms "gasoil" and "diésel" which may not mean the same thing as they do in English (in Italy, btw, diesel fuel is always termed "gasolio"). But these two terms indicate a very similar entity, even though maybe not identical. So, I reworked Turiel's text a little in order to use only the term "diesel". Folks, this book, Oil, Power, and War, is truly unbelievable: Matthieu Auzanneau did an enormous amount of work in digging out and reporting the whole story of the first half of the oil age, from its beginning all the way to the now, when we are reaching the global peak (and the fall may be much faster than the growth as Lucius Annaeus Seneca noted long ago). 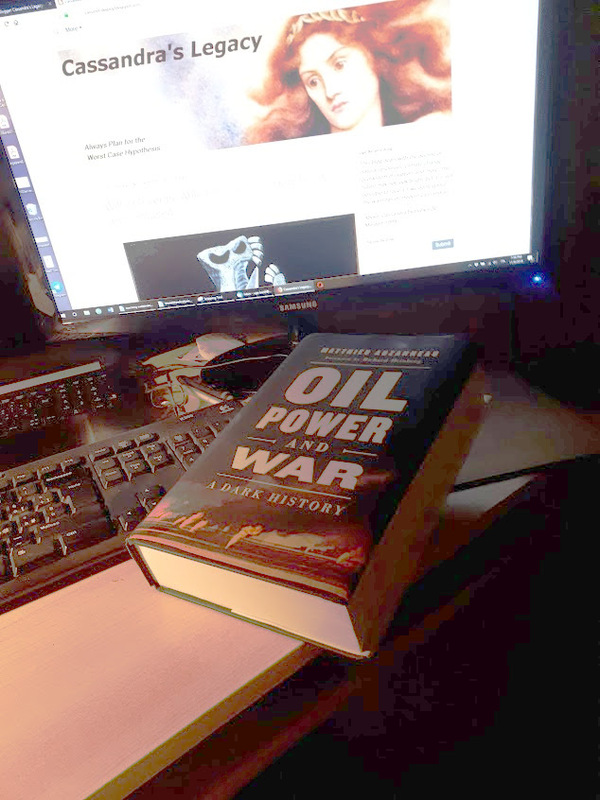 I have to tell you, after having studied oil depletion for some two decades and having written at least three books on it, I thought I knew something about oil. But this book amazed me with the number of things I had missed. Just an example: did you know that British planes of the Battle of Britain, during WWII, had a higher octane fuel than the German ones? That was an important advantage for Britain: a few extra octane points obtained by being able to start with a different oil source may have won the war for the allies! 20 years ago, Colin Campbell and Jean Laherrere published an article on "Scientific American" that was to start the second cycle of interest on oil depletion (the first had been started by Hubbert in the 1950s). Their prediction turned out to be too pessimistic, at least in terms of the supply of combustible liquids, still growing today. Yet, it was a valuable warning of things to come, unfortunately ignored by decision-makers worldwide. The first cycle of interest in oil depletion was started by Marion King Hubbert in the 1950s. Although it provided successful predictions for the production of crude oil in the US, the interest in oil depletion waned in the 1980s. 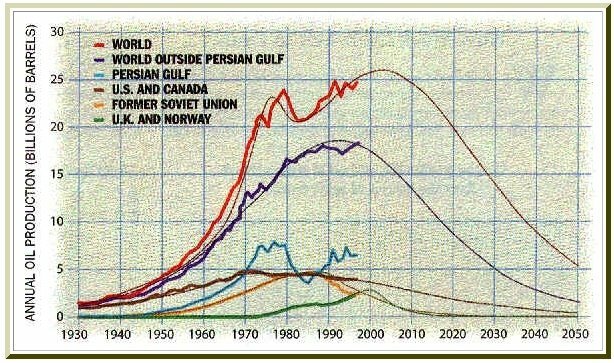 The same destiny of growth and decline awaited the second cycle, that went under the name of "peak oil movement" and that was generated in 1998 by a famous article published by Colin Campbell and Jean Laherrere on "Scientific American." Today, the second cycle is winding down and even mentioning the concept of "peak oil" is enough to be branded as a diehard catastrophist, unable to understand how the fracking revolution is leading us to a new age of prosperity under America's energy dominance. Yet, there are symptoms that the great peak could be finally arriving and - who knows? - a third cycle of interest in oil depletion could be starting. I published some considerations on this subject in an article that appeared on "Energy Research & Social Science" -- it is "open access" and you can find it at this link. After re-examining the story of the peak oil cycle, I conclude that there was no solid reason to reject the peak oil studies, as it was done starting in the mid 2000s. The reasons for the rejection were related more to the incompatibility of the peak oil concept with the (still) current economic views based on the idea that the depletion of natural resources is not -- and cannot be -- a constraint to economic growth. It will take time before some concepts percolate from biophysical economics into mainstream economics - if they ever will. In the meantime, humans continue to destroy the resources that make them live, running as fast as they can toward the Great Cliff. From "Peak Oil 20 Years Later"
... Overall, we can say that, even though the role of non-conventional oil sources was not correctly evaluated and the date of the peak missed at the global level, the Hubbert theory produced correct predictions and, in general, a valuable warning of difficulties to come. So, there never were compelling reasons based on historical data to dismiss the peak oil idea as wrong or untenable. Nevertheless, this is what happened. I know that I have crammed together too many ideas here: Tolstoy, St. Francis, critical phenomena, thermodynamics, and more, - it is contrary to the rules of blog posts. But the centennial of the end of the Great War gave me the occasion to write something about how, in 1914, the European states sleepwalked into the Great War just like we may be doing nowadays. If the Great War couldn't end all wars as it was said to be able to do, the greater one that may be coming could actually do that, but in a very different way. The new war could lead to the extinction of humankind. So, what hope do we have? I don't know, but the first step to solving a problem is to understand it. So far, humans haven't learned anything much from the mistakes of the past but, who knows? Maybe one day they will. 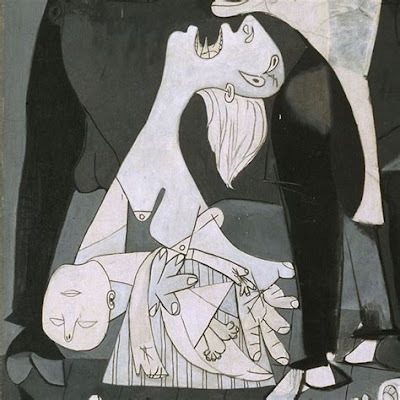 The centennial of the end of the Great War is a good occasion to rethink a little about wars: why, how, and when wars occur and if there is any hope to stop blindly walking along a path taking us to the possibility of the complete annihilation of humankind. It is a question that has been posed many times and never satisfactorily answered. Perhaps the first to try to answer it was Leon Tolstoy in his “War and Peace” novel, (1867), where he wondered how it could be possible that a single man named Napoleon could cause millions of men to move all together eastward with the purpose of killing other men whom they had never met and they had no reason to hate. Tolstoy had grasped the concept that war is not the result of mad dictators giving orders to their followers. It is not even a rational struggle for resources or for money, although that factor plays a role. It is just something that happens beyond the human capability of controlling it, or even of understanding it. One century after Tolstoy, statistics had advanced to the point that a quantitative analysis of the war phenomenon became possible. The British meteorologist and physicists Lewis Fry Richardson (1881-1953) applied the concept to the frequency and the size of human wars and more in general to what he called “deadly quarrels.” Richardson found that wars are random phenomena, unpredictable and unrelated to almost anything else: they just happen. More recent work confirmed the early analysis by Richardson, finding that wars follow "power laws." Some recent work we did with my coworkers Martelloni and Di Patti confirms this result over a time scale of some 600 years and worldwide (preliminary results, to be published soon). It is a subject that I already discussed in an earlier post. Power laws are typical "emergent phenomena" that take place in complex systems. They are the result of the dissipation of accumulated energy that occurs not gradually but in bumps. 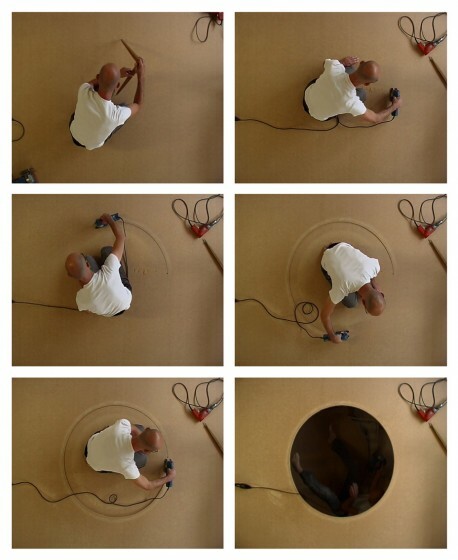 The quintessential system that behaves in this way is the "sandpile" that Per Bak used as a representation of the condition that he called "self-organized criticality." Fascinating in a mathematical model, these bumps can be deadly in the real world. Earthquakes, landslides, avalanches and more phenomena involving natural disasters tend to occur following power laws. These results confirm Tolstoy's intuition: wars are not the result of ideologies, religions, mad rulers, or the like. They emerge out of a social network as a result of the way the system is connected. That doesn't mean there are no causes for wars: they are the result of accumulated capital that needs to be dissipated in some way. Wherever there is an unbalance in the accumulation of capital, the excess will spill from the more endowed side to the less endowed one. In a sense, war is the offspring of capitalism, but capitalism is just another emergent phenomenon of complex societies. In short, wars are not caused by a lack of resources, they are caused by an excess of resources. When a new world war will start can't be exactly predicted -- it is like for earthquakes. Nobody can say exactly where and when a major earthquake will take place, but we know that there is a certain probability for it to occur in seismic zones and, sooner or later, it will. The same seems to be valid for wars. So, the fact that the start of wars can't be exactly predicted doesn't mean we can't see that today we are running at full speed toward a new one. If the trend of the past 600 years continues to hold, there is a larger than zero probability that we'll see a new conflagration that could surpass of an order of magnitude -- or perhaps more than that -- the second world war in terms of destruction and number of victims. Could we do something to avoid that outcome? We have to look at the basics: if wars are like earthquakes, they are a thermodynamic phenomenon that dissipates accumulated energy. In the case of earthquakes, there is nothing we can do to avoid the movement the Earth's tectonic plates and the accumulation of energy at the faults that separate them. In the case of wars, the accumulated energy to be dissipated is in the form of capital, in a general sense of money, riches, population, resources, etc. Can we avoid the accumulation of capital? Not so easy in a society that sees the accumulation of riches as a good thing to be encouraged in individuals as well as in entire societies. So, is it our destiny to see the end of humankind in a series of clouds of radioactive smoke? Perhaps. But I would also like to add something more: the cycle of energy dissipation in the form of war is something that we can approximately measure only for a period of existence of humankind of a few centuries in the past. And this was a period of economic expansion, eventually propped up by the availability of fossil fuels. Once we cross over the peak of this great historical cycle, many things could change and capital might be more difficult to accumulate. That would change many things, perhaps also the probabilities of major wars to occur. Of course, you don't need a lot of capital accumulating in order to have a war -- we know that tribal societies are far from being peaceful. But tribal wars, at least, don't take with them the whole Earth's ecosystem. It is, after all, something that St. Francis had already discovered long ago at the individual level: material poverty can make you a better person if you willingly accept it. It took a thousand years before someone (Aurelio Peccei among the first) that inequality among nations is the mother of all wars. Could the human society embrace "Lady Poverty" as Francis did? Would that avoid wars or, at least, the kind of apocalyptical wars that could be waged today? We cannot say, but perhaps a dim glimmer of hope remains even in this dark period. One hundred years after the end of the war that was to end all wars, the First World War, we still don't understand what wars are, why we fight wars, why we can't stop fighting them. We are surrounded, it seems, by things we don't understand: why do people fight wars? Why are wars so commmon? Why can't we find a way to stop them? Why people still fall for the most obvious propaganda tricks? Below, you can find an excerpt from the 1980 book by David Wilkinson, "Deadly Quarrels" that starts with a list of the various theories put forward in modern times to explain how peace could be attained. Still perfectly valid today, the list highlights the confusion pervading the attempts to put an end to war. It reminds the 200+ theories that Demandt reports for the reasons of the fall of the Roman Empire. More than that, it reminds of Paul of Tarsus (Corinthians 1) when he says "God hath chosen the foolish things of the world to confound the wise." And this is war, a foolish thing that keep confounding us. Peace through morality. Peace (local and global) can be brought about by a moral appeal, through world public opinion, to leaders and peoples not to condone or practice violence, aggression, or war, but to shun and to denounce them. Peace through law. Peace can be made by signing international treaties and creating international laws that will regulate conduct and by resorting to international courts to solve disputes. Peace through negotiation. Peace can be maintained by frank discussion of differences, by open diplomacy, by international conferences and assemblies that will air grievances and, through candor and goodwill, arrive at a harmonious consensus. Peace through political reform. Peace can be established by setting up regimes of a nonaggressive type throughout the world: republics rather than monarchies; democratic rather than oligarchic republics; constitutionally limited rather than arbitrary, autocratic regimes. Peace through national liberation. Peace can be instituted only through the worldwide triumph of nationalism. Multinational empires must be dissolved into nation-states; every nation must have its own sovereign, independent government and all its own national territory, but no more. Peace through prosperity. Peace requires the worldwide triumph of an economic order that will produce universal prosperity and thereby remove the incentive to fight. Some consider this order to be one of universal capitalism, or at least of worldwide free trade; others hold it to be some species of socialism, reformist or revolutionary, elitist or democratic. Peace through disarmament. Peace can be established by reducing and eventually eliminating weapons, bases, and armies, by removing the means to make war. Peace through international organization. Peace can be established by creating a world political organization, perhaps even a constitutional world government resembling national governments, to enforce order and promote progress throughout the world. Peace through power. Peace can be maintained by the peaceable accumulation of forces, perhaps overwhelming, perhaps preponderant or balancing or adequate-sufficient to deter, defeat, or punish aggression. Much current talk on war and peace amounts to no more than high-handed assertions that my chosen theory is right, and all others therefore are evidently wrong. (*) Wilkinson's "Deadly Quarrels" is a discussion of the studies performed by Lewis Fry Richardson from the 1930s to his death in 1953. Richardson was one of the first researchers who tried to put forward a quantitative theory of war. With my coworkers Gianluca Martelloni and Francesca Di Patti, we are re-examining the statistical patterns of war. We are finding, unfortunately, that Richardosn was basically right: wars are a random phenomenon similar to earthquakes and avalanches -- very hard both to predict and to stop. Epistemology of a Dying Empire: Can Growth Last Forever? Recently, Michael Liebreich published an article titled "The Secret of Eternal Growth." I have been mulling over in my head if it is appropriate to spend time discussing one more mishmash of legends, including the one that's by now a classic, the "errors" that the Club of Rome is said to have made with the 1972 report, "The Limits to Growth." Eventually, I decided that it was worth a post, not so much because the post by Liebreich is especially wrongheaded or silly, but because it illustrates one basic point of our civilization: who, and how, takes decisions? On which basis? Everyone uses models all the time. Every person in his private life and in his community life uses models for decision making. The mental image of the world around one, carried in each individual’s head, is a model. One does not have a family, a business, a city, a government, or a country in his head. He has only selected concepts and relationships that he uses to represent the real system. And the big question is where these "selected concepts" come from. My impression is that the mind of our leaders is a jumble of ideas and concepts grafted from haphazard messages that come from the media. Our leaders use no quantitative model to take their decision, only whim and feelings. This is how an idea such as MAGA came about. 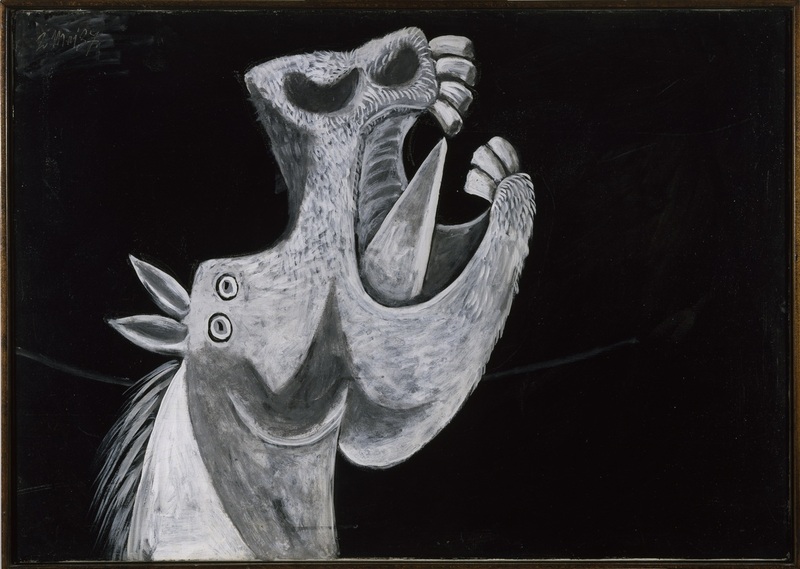 The point is that there seems to exist a certain convergence of ideas and concepts in the mediasphere. Somehow, a consensus tends to appear and it is reinforced by repetition. This is how the world's leadership tends to assume the existence of some self-evident truths, such as that economic growth is always good.
. . . a group of concerned environmentalists calling themselves the Club of Rome invited one of the doyens of the new field of computer modelling, Jay Forrester, to create a simulation of the world economy and its interaction with the environment. In 1972 his marvellous black box produced another best-seller, Limits to Growth (iv), which purported to prove that almost every combination of economic parameters ended up not just with growth slowing, but with an overshoot and collapse. This finding, so congenial to the model’s commissioners, stemmed entirely from errors in its structure, as pointed out by a then fresh-faced young economics professor at Yale, William Nordhaus. Note how Liebrich provides a reference to the "Limits to Growth" book, but none for the supposed "pointing out of the errors in its structure" by the "fresh-faced" William Nordhaus. The reality is that Nordhaus wrote a paper criticizing Forrester in 1973 and Forrester responded to it with another paper, defending his approach. It is perfectly legitimate to think that Nordhaus was right and Forrester wrong, but you can't say that that the purported "errors" in the model are an established fact. I discussed this story in my book, "The Limits to Growth Revisited" and in a recent post on "Cassandra's legacy." Basically, Liebrich reported a legend without bothering too much about verifying it. There is much more in Liebrich paper that can be criticized in terms of mistakes, personal attacks, misinterpretations, and more (see also another critical assessment by Tim Jackson). But the point is how ideas are thrown into the mediasphere and there they float, to be picked up by human minds as flu viruses flow in the air. Here, Liebreich's thesis is likely to have a certain influence because it is so cleverly presented: basically it tells us that you can eat the pie and still have it. It tells people that humankind can keep growing while reducing its impact on the ecosystem. It is like telling a heroin addict that heroine is good for health and it is OK to continue using it because technological progress will make it possible to get the same kick - or even more kick - from a lower dose. That is what a heroin addict likes to hear, but it won't work in the real world. The same is true for our leaders and for all of us. We tend to make choices on the basis of what we like, not on how things stand. The sickness of the Empire, in the end, is just bad epistemology. One Hundred Years Ago: the end of the war that should have ended all wars. The front cover of the book I published this year dedicated to the memory of a forgotten hero of the Great War, Armando Vacca. He fought for peace as much as he could, to the point that he had to give his life for a cause he had fought against. He died as a martyr for his Christian faith on the Carso mountains on July 21st, 1915. One Hundred years ago, on Nov 4th, 1918, the Great War, also known as the First World War, ended for Italy with Austria-Hungary surrendering. The war would last a few more days on the Western front. I think it is appropriate to celebrate this day with some words of a beautiful song by Eric Bogle, "The Green Fields of France."